This program meets the national standards according to the American Diabetes Association guidelines. 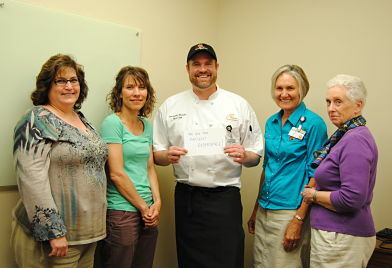 Cabinet Peaks Medical Center's Diabetes Care Program is a satellite of Kalispell Regional Medical Center. KRMC is our sponsoring organization and collaborates with the Libby program for optimal Diabetes Self-Management Education. What's New In Diabetes Health? Making small changes to the food you eat and adding more physical activity can help you lose weight and feel better. The PREVENT program puts you in classes with others who have similar struggles and health concerns. Lifestyle coaches and trained health care professionals who will help you make these small changes and support you during the good times and over the rough bumps. Prevent encourages its participants to make healthy lifestyle changes! Program tuition is only $100, and partial reimbursement is available after successful completion of the 10 month program. Had gestational diabetes mellitus (GDM) or delivered a baby over 9 pounds. Due to our ADA recognized status, class and clinic visits have been approved for Medicare and Medicaid reimbursement. Private insurance may also cover these services. We suggest you contact your insurance company for more information and pre-approval. Pre-pregnancy planning with Type 1 diabetes. Importance of exercise and blood glucose management. Preparation, administration and precautions of medication. Prevention, detection, and treatment of complications. Signs and symptoms of low and high blood sugars. Proper skin, foot and dental care to prevent problems. Pump therapy can help patients acheive near normal blood glucose levels. Insulin is delivered via an infusion set under the skin. Pump candidate guidelines, limitation, and benefits of pumping. Getting started by selecting a model, operation, and pump programming. CPMC diabetes program is a sponsor of the local support group for ongoing education and awareness. Libby meetings are generally the 2nd Tuesday each month at Christ Lutheran Church. Occasionally the meeting times/places will be changed to accommodate guest speakers. Contact Jill at (406)283-7318 for more information. Our certified Diabetes Educators have completed advance studies related to diabetes and hold national certifications. All of our educators stay informed about the latest methods and treatments. Who qualifies as a Certified Diabetes Educator? CPMC has experienced staff with more than forty years of combined practice in the diabetes field. These Certified Diabetes Educators complete advanced studies and take an examination through the National Certification Board for Diabetes Educators. Certification demonstrates that the practitioner possesses distinct and specialized knowledge with which they promote quality care for people with diabetes. Our expert educators are trained and licensed as either registered nurses or dietitians, providing a comprehensive skill set for excellent patient care. Who is the CPMC Diabetes Advisory Board? The CPMC program utilizes a diverse group of health care experts to assist in development of programs and policies, and to help establish performance goals. The Advisory Board consists of physicians, registered nurses, registered dieticians, and diabetes and health consumers.